Until fairly recently, the idea of green living has had a radical, revolutionary tinge to it. While it’s certainly proven to be revolutionary, the green living movement’s effect has been so far-reaching that it’s become a standard for homeowners looking for new ways to save on energy costs and make the most of their available square footage rather than adapting a too-large and inefficient space. When all is said and done, there’s a great deal of common sense and creativity in home remodels that we would consider “green.” In many ways, being eco-friendly means doing more with less. For homeowners wanting to make a statement, it’s easy to get caught up in new and high-end materials that reflect a certain gracious style of living. As tempting as that might be, it’s hardly the best way to create a sustainable and eco-friendly living environment. Instead, consider using reclaimed materials such as wood, which adds a distinguished and settled look to your home. Many green homeowners have elected to use reclaimed wood for kitchen upgrades, including countertops, flooring, and for striking accents throughout the home. It’s an environmentally responsible choice because it’ll save the money and energy it would require to create another, less sustainable product. One of the best ways to make green changes in your mode of living and save money is to replace old and inefficient appliances with new and economical dryer, dishwasher and refrigerator models that have earned Energy Star certification. These new designs have been created for energy efficiency as well as performance and reliability. Recycling can mean a lot of things, everything from keeping plastic and metal items from being dumped in the landfill to purchasing used clothing at a consignment store. That definition certainly extends to home upgrades, which offer ample opportunities to replace costly household items with used substitutes such as refrigerators from retailers who specialize in such items, or salvage shops that can give you a good deal on pre-used counters and cabinets. It may or may not work for you in every respect, but it can certainly save money and constitutes an environmentally friendly commitment. Many common household objects, such as carpeting and paint, contain chemicals that are toxic to humans and damaging to the environment. These volatile organic chemicals (VOCs) can cause allergic reactions, skin problems, respiratory issues, and headaches. Many well-known companies, such as paint manufacturer Benjamin Moore, began making environmentally safe products with no VOCs several years ago and today offers non-toxic paints in every color. If you’re considering a painting upgrade or seeking a DIY project, look for green-friendly product offerings that eliminate airborne toxins. The sun can provide a cost-effective and sustainable energy alternative, though it may not be enough to take you off the grid altogether. 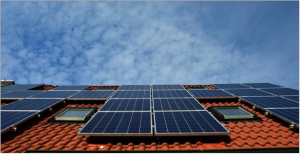 Many homeowners choose to install solar panels or skylights to let the sunshine in and reduce energy costs. It can be a costly undertaking, so consider taking it a step at a time if it’s not financially viable for you. Consider hiring a professional to install solar panels for electrical systems, which costs an average of from $234 to $516 in Denver, Colorado. Going green with your home remodeling can be done affordably and often without the cost of hiring a contractor. It’s not always about expensive upgrades. Often, using new paint or buying energy-efficient appliances can lead you to a greener, more sustainable lifestyle.